The family is on the shore of Pelly Bay in May-June. A seal basks beside its hole under a warming sun. The hunter stalks the seal, kills it and drags it to the family camp on shore. Man and wife skin the seal, cutting the hide into rings that girdle the body. Stripped of blubber, the rings are then cut spirally into long thongs. The boy plays on the shingle imitating the circling gulls, while the man stretches his thongs between rocks and scrapes away the fur. The woman dresses the seal, wasting nothing, braiding the intestines. A seal is seen nosing from a snow-melt pool. The hunter sits at the door of his tent shaping a new bone tip for his harpoon. The woman is in the tent sewing a fur mitten. They eat a little frozen fish; then the hunter finishes his harpoon and sets out after seal. After a long imitative stalk, the hunter moves too soon, alerting the seal, and his harpoon misses. In camp the woman skins a flipper and the boy plays. The hunter prepares for a night vigil at the breathing hole of the seal. 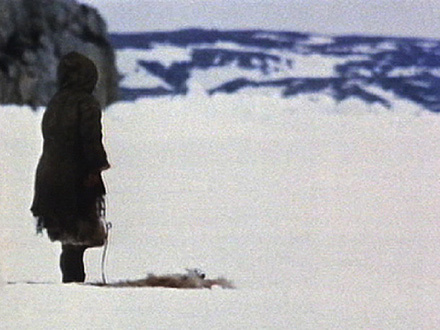 Next morning the woman scrapes a seal skin, the boy plays on shore, and the hunter still waits for the seal. When again he fails, he turns to egg collecting on the cliff where the gulls nest. Finally the family packs its belongings on a bear skin and shifts along the coast to another area.